Definition: kinetic energy - The energy possessed by a system or object as a result of its motion. The kinetic energy of objects with mass is dependent upon the velocity and mass of the object, and is equal to the product of half the mass times the square of the speed. 11/4" & 11/2" diameter x 30'. Rated for full-size 4x4s & Trucks. Chafe guarded loops on each end. High Strength & High stretch. Made from Nylon Double Braid. The Mega Kinetic Recovery Rope is designed for recovery above and beyond your standard off-road recovery. The OKoffroad kinetic recovery rope is probably the most technically advanced recovery tool in the off-road world. Using the principles of kinetic energy for maximum effect, this kinetic recovery rope will stretch and safely pull a large vehicle to safety. For extreme-duty tugging and snatching of stuck vehicles in mud, snow, or sand. Our Mega ropes are used by U.S. Fire Departments and our Armed Forces, and are engineered for mega-duty applications and are of the highest U.S. quality. .
Total . $254.99 . $244.99 . $324.99 . 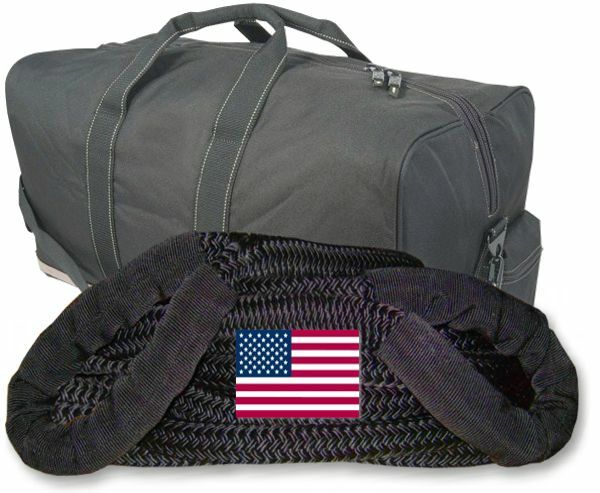 Price Saving: The oversize Recovery kit bag has a retail value of $39.95. Get it here with your Kinetic Recovery Rope for $29. Protect your Kinetic Recovery Rope by storing it in our handy kit bag. Don't just throw that Kinetic Rope into the back! Store it carefully, and it will be there for you when you need it. Holds your other recovery gear too. .
Total . $283.99 . $273.99 . $353.99 . Build Your Own Recovery Kit is a customizable ordering process where you choose the products in your off-road recovery kit. Up to 20% off product prices. . This kinetic recovery rope, a heavy-duty tool used in the recovery of stuck vehicles in snow, mud, or sand. It is made of Nylon Double Braid enabling High Strength & High stretch. Now available in black too. .